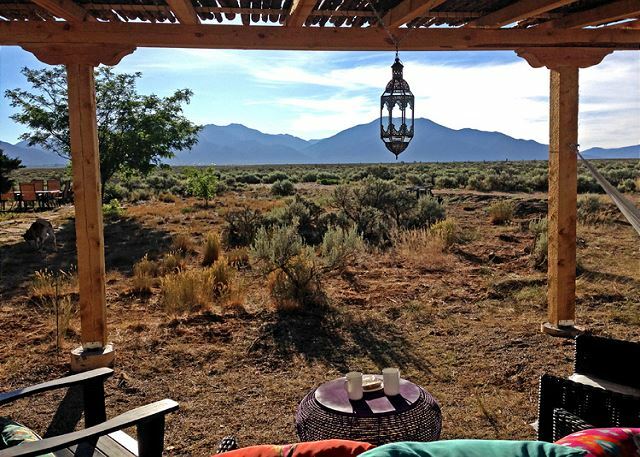 Stay at Adobe de Artista and treat yourself to a true Taos, New Mexico lodging experience – one of adventure, whimsy and relaxation. 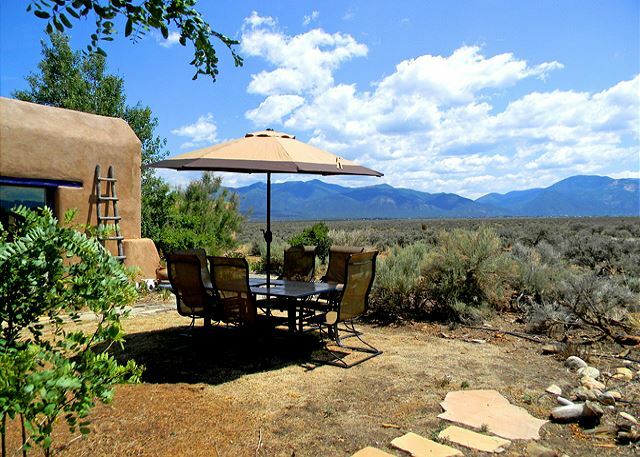 Whether seeking pristine mountain / mesa views, unique architecture, artistic flair, the “must see” Taos Gorge Bridge, the Rio Grande del Norte National Monument or proximity to the quaint village of Taos, New Mexico or Taos Ski Valley, this home has it all. In addition, the best kept secret of all is the 3 mile drive down into the Rio Grande Gorge with the John Dunn Bridge and hot springs. One can spend the day having a leisurely picnic in nature, soaking in the river, fishing along the edge, hiking up the gorge or kayaking (if one brings one's own kayak). Boasting 3 Master bedrooms, each of the home’s bedrooms provide total privacy from the rest of the living areas with their own shower bathrooms that can be closed off from entry or pass-through by others in the home. 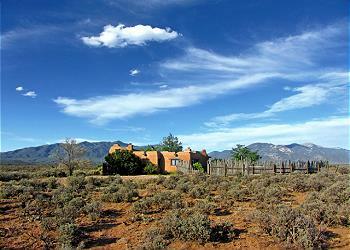 Two have direct access to the outdoors, where walking trails can be discovered nearby on the mesa. When rented to 6 guests the Den / Bedroom acts as a master bedroom with enclosed bathroom. 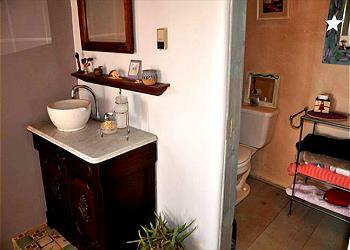 When rented to 8, this bathroom offers a second entry door for 2 banco (Spanish for bed or bench) sleeping children. 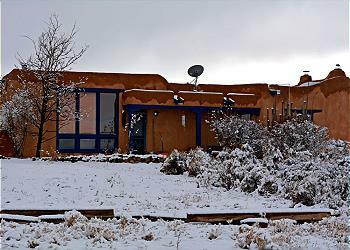 A custom home designed and built by Taos’ famous painter, Ed Sandoval, this distinctive residence is built with manmade Old World style adobe bricks. 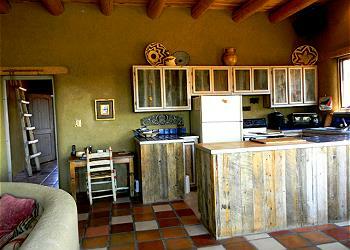 Many interior walls glitter with straw and mica made from pure unadulterated New Mexico earth. 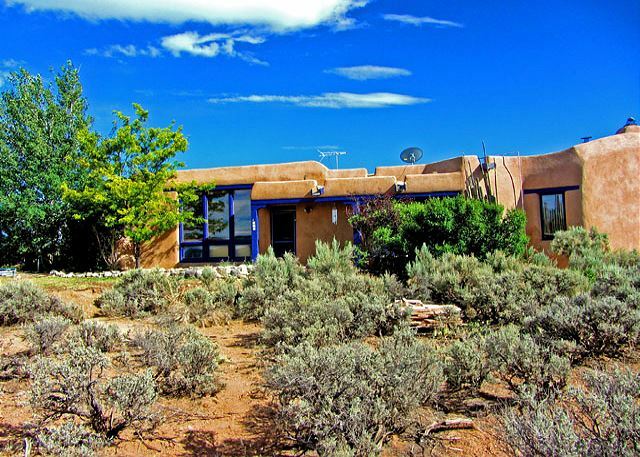 Mica is a naturally-occurring element in surrounding land that gives Taos Pueblo pottery its characteristic glistening appearance. 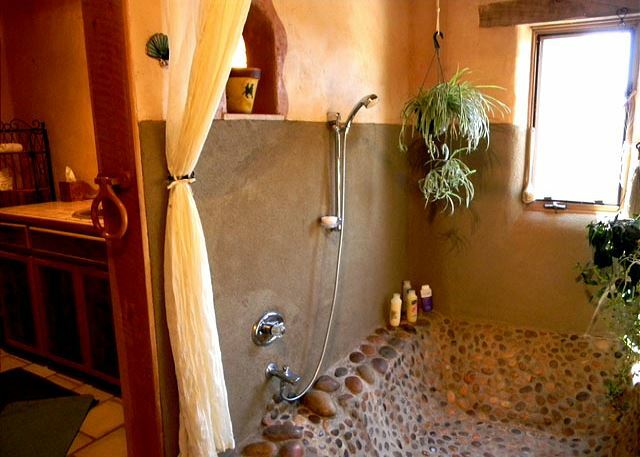 Unexpected swirls of paint in bedrooms and bathrooms add a whimsical ambiance and a river stone shower/tub surrounded by plants make the master bathroom feel like a garden. 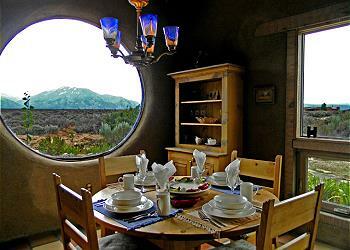 This home is not just livable art but it is warm, inviting and nurturing to the soul. Staying in for the day? 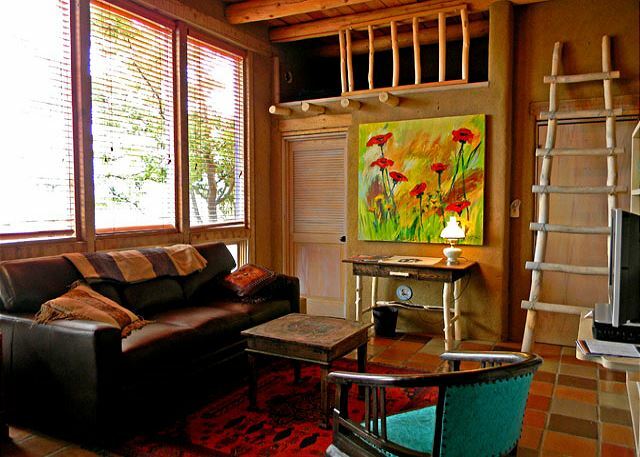 Depending on the weather, put your feet up and read a book on the banco in the “conversation pit” next to a traditional wood-burning kiva fireplace; enjoy a glass of wine on the portal swing or ramada hammock while listening to birds and soft chimes blowing in the breeze; or prepare a favorite meal on the grill and dine beneath an umbrella while taking in the magic of Taos Mountain. For good weather (which is most of the time) you may prefer heading out for a mountain or river excursion, or some local culture? The river is only 4 short miles away. Not sure how you want to spend the day? You’ll find the home contains all the material you need to determine the best places to go for entertainment and dining to suit your every whim. On return from your outing, no matter what the season, soothe tired muscles in the hot tub beneath a moonlit sky so clear you can see the Milky Way. 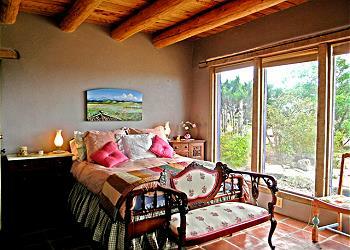 Finally, sleep like a baby on beds appointed with foam or pillow-top mattresses within thick adobe sound muffling walls. 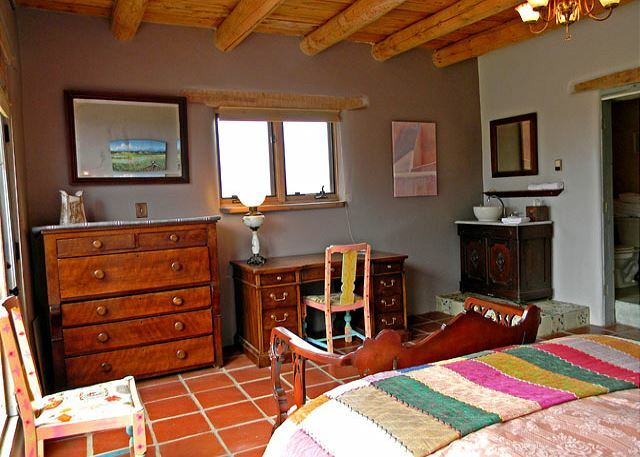 Whether this is your first or 100th visit to Northern New Mexico, Adobe de Artista promises a stay like no other in traditional Taos artful adobe living. Come and live like the true “locals” starting back in the 1920’s to current days. Room Description: SLEEPING ARRANGEMENTS Master bedroom #1 = Queen, Master bedroom #2 = Queen, Master #3 (Den/bedroom) Queen "American Leather" State of the Art sleeper sofa. 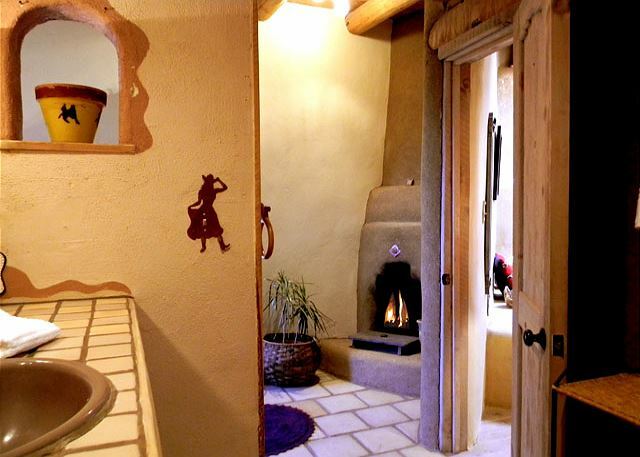 Guests say "More comfortable than most beds" and "Best night's sleep in year's".